Maria Bucci, daughter of Antonio Bucci and Teodora Mancini, was born on December 20, 1897, at Isernia, Italy. 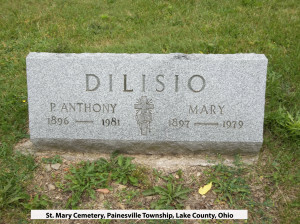 She married Pietrantonio DiLisio, son of Giuseppe DeLisio and Maria Steluta, on February 8, 1919 at Ashtabula County, Ohio. 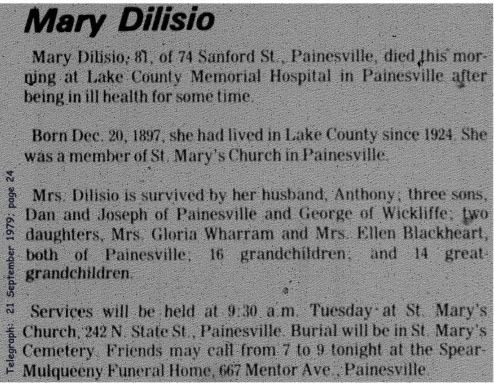 Maria died on June 4, 1979, at Lake County Memorial Hospital, Painesville, Lake County, Ohio, at age 81. Her body was interred at St. Mary Cemetery at Painesville Township, Lake County, Ohio. Maria Bucci, age 7, immigrated to the United States on February 6, 1905. She was travelling to Ashtabula, Ohio, with her parents. Maria Bucci first appears in the Painesville, Ohio, area in 1924. 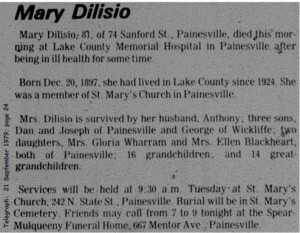 Mary Dilisio became a citizen of the United States on August 27, 1943. Mary resided at 203 Sanford Street, Painesville, Lake County, Ohio, when she was naturalized. At the time of her death, Maria resided at 74 Sanford Street, Painesville, Lake County, Ohio.